Jurgen Klopp will be watching eagerly to see if his Liverpool players have learned from their mistakes when Watford visit Anfield in the Premier League on Saturday. Klopp made clear that his players were too slow to react to second balls last weekend, as they fell to only their fourth league defeat of the season in losing 2-1 at Manchester United. That defeat cost Liverpool the chance to go second, although with both United and Tottenham in FA Cup action this weekend, Klopp’s side will go third if they avoid defeat against Watford. The key to success on Saturday will be to ensure they remain solid while maintaining their attacking threat, something they failed to do when they drew 3-3 with Watford at Vicarage Road on the opening day of the season. Liverpool trailed twice that day, then went ahead through Mohamed Salah’s first goal for the club, only to concede a 94th-minute equaliser to Miguel Britos. That was a sign of the defensive troubles that have continued to plague Liverpool. At Old Trafford last Saturday, they conceded two avoidable first-half goals to Marcus Rashford, then ran into a metaphorical brick wall as they attempted to save the game. Klopp could reflect on the fact that his team lost despite having 67.9 per cent possession during the game and 14 efforts on goal to United’s five. “The second balls were not good around the two situations where we conceded,” said Liverpool midfielder Emre Can. “In my position, it was not good from me. We have to learn from it and do it better in the game against Watford. “We made very easy mistakes when we conceded the goals; we have to defend better as a team there. Despite the disappointment of losing for only the second time in their past 21 league matches, Liverpool can take solace from the fact that their overall form is good. They remain one of only two teams yet to lose a Premier League game at home this season, and have a Champions League quarter-final to look forward to in April. Klopp also has more or less a full squad to choose from, with only defender Nathaniel Clyne definitely unavailable as he continues to recover from a long-term back injury. They do have one other concern, though. Midfielder Can has collected nine bookings this season, and one more on Saturday will bring him a two-match domestic suspension, keeping him out of the Merseyside derby against Everton at Goodison Park on April 8. Watford are yet to score on their travels under new manager Javi Gracia, but it’s at the other end of the pitch where their troubles lie. The Spaniard, who has seen his side go scoreless on the road for the last six hours, is wary of the threat posed by Sadio Mane, Salah and Roberto Firmino. “Nobody has won at Anfield in the league this season so it won’t be easy,” he said. Third bottom Crystal Palace, beaten in their last four games, travel to Huddersfield while West Bromwich Albion, bottom of the table and eight points from safety, desperately need a victory at Bournemouth. Stoke are also embroiled in the fight for survival and Paul Lambert’s second bottom team will aim to end a six-match winless run when they host Everton. 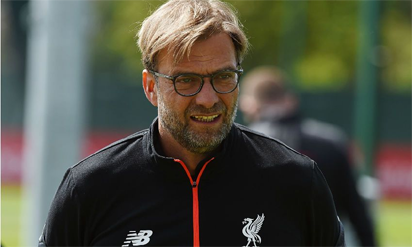 The post We have to learn, will do better in the game against Watford – Klopp appeared first on Vanguard News.